I never really thought I'd like a big phone. Then the original Galaxy Note hit the market and changed the smartphone market forever: for the first time (that I can think of) we had a phone with a display that measured more than the standard 3.5 – 4 inch screen. It was a little too big for me at first. I felt kind of goofy trying to make a phone call while holding a 5.3-inch display to my head. I also felt a little weird when I was on the subway trying to read through my comics with one hand while my other hand held on to the subway bars. Then I tried going back to smaller-sized phones and they all just felt too small. I love big screens for reading, viewing photos and videos and, especially, for gaming. I thought the 5.5-inch screen on the Galaxy Note II was going to pass the "too big for me" mark. I've been using a Galaxy S III for the past several months and the 4.8-inch screen feels just right, even though my friends still call it a "freakin' tablet phone." Then, today, I actually got to play with the Galaxy Note II. 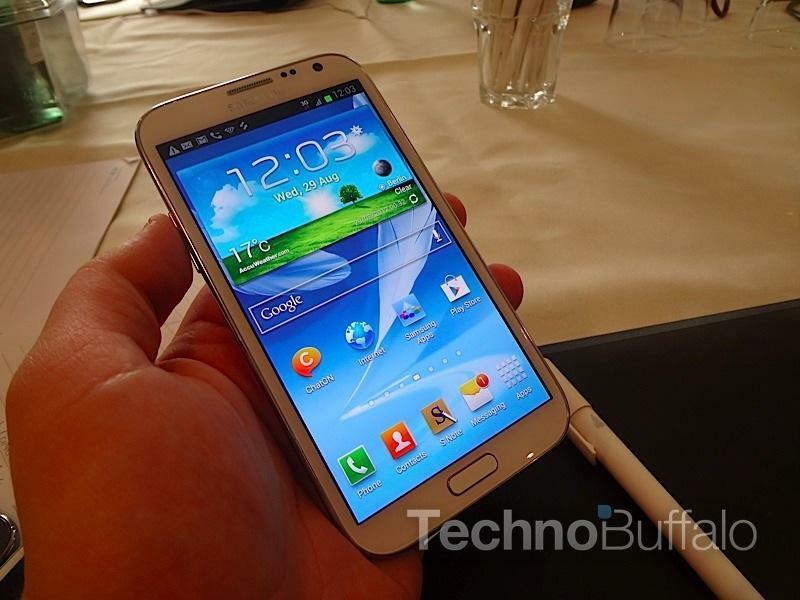 It's huge, sure, but it's much more like the Galaxy S III than it is the original Note. It has rounded edges, a thin design and feels like less of a "brick" and more of a, well, large phone. It's only 9.4mm thin and weighs just 180g. Plus, there are a ton of software enhancements. Samsung enhanced the S Pen's feature set with new options such as "Air View," which allows you to control movies or view galleries without touching the screen, "Quick Command," allows you to write "@Kevin" and automatically begin pulling up an email to that person, "Screen Recorder" for recording audio and anything occurring on the screen, and much more. The Galaxy Note II offers all of the features of the Galaxy S III that I love, including Buddy photo share, NFC, pop-up play and an awesome 8-megapixel camera. I'm not really turned off by the size of the Galaxy Note II. It doesn't actually seem as big in person, which is a great thing. Maybe I won't be embarrassed to carry it on the subway since, at its core, it's more like a giant Galaxy S III on steroids. Samsung didn't say when the Galaxy Note II will launch exactly — it just said during the fourth quarter — but I already know it's going to be at the top of my gift wish list.